It is often said that Australian-based slots developer Aristocrat are the kings of Asian-themed slots. However, this 2Can slot shows that they actually produce some decent titles that have a bit of a wild animal theme to them. 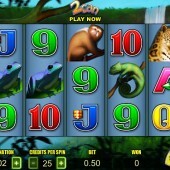 You can clearly see by the witty word play that this slot focuses on the species of the toucan. 2... Can... get it? Ha! 2Can is a 5 reel, 25 payline slot that visually looks like a number of other Aristocrat slots that have hit the market. The reels are set against a leafy background that you would have seen similar to in the fluffy and adorable Bunny's Rabbits slot or the impressive Wild Panda slot. Symbols across the reels include wild animals you would expect to encounter in the wild jungle. There are cheetahs (or leopards... what's the difference again?! ), monkeys, frogs, lizards, butterflies, and the regular 9-through-to-Ace symbols. The 2Can... sorry, I mean toucan, acts as the Wild on this slot. It substitutes for all other symbols, except for the Scatters, to complete possible winning combinations that might pop up on the reels on a single spin. All Wild wins begin on the most left reel and pay left to right on adjacent reels. Scatters are represented by the exotic flowers. You will need to hit these to trigger the free spins bonus round. If you hit three Scatters on the reels you will earn 10 free spins. Hitting four Scatters will give you 15 free spins. Finally, five Scatters will see you win 20 free spins. It is possible to re-trigger the free spins bonus round. During the free spins, it is possible to earn additional Wilds when you hit a Wild symbol on the reels. The animation linked with this feature is quite cool. The toucan in the Wild symbol will fly off the reels and two toucans will fly back onto the reels. The one toucan will re-occupy its spot in the original Wild position and the second toucan will land on a random symbol and turn it Wild. 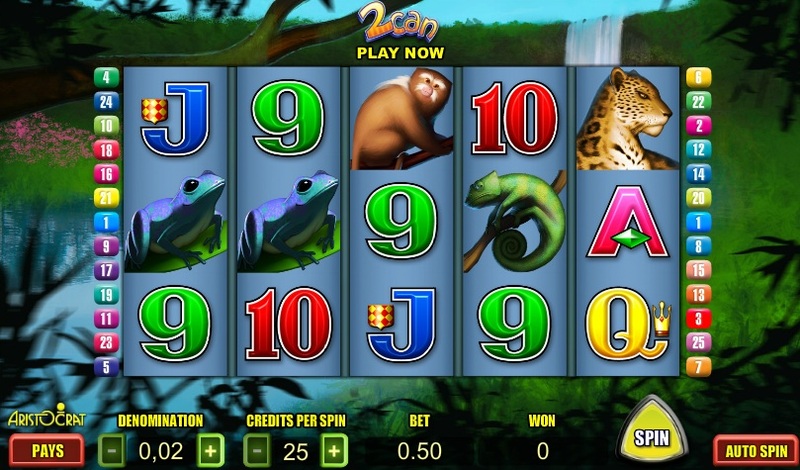 Believe it or not, this is not the first toucan-themed slot to launch on the market. The surprisingly enjoyable 1 Can, 2 Can from NextGen Gaming has fantastic graphics but it does not quite match the levels of excitement that this Aristocrat title produces with the additional Wilds in the free spins. We really should expect this now. An Aristocrat slot that delivers the goods. I just didn't expect it to come in the form of a toucan.